This little one has an attitude or maybe she is taking it all in. 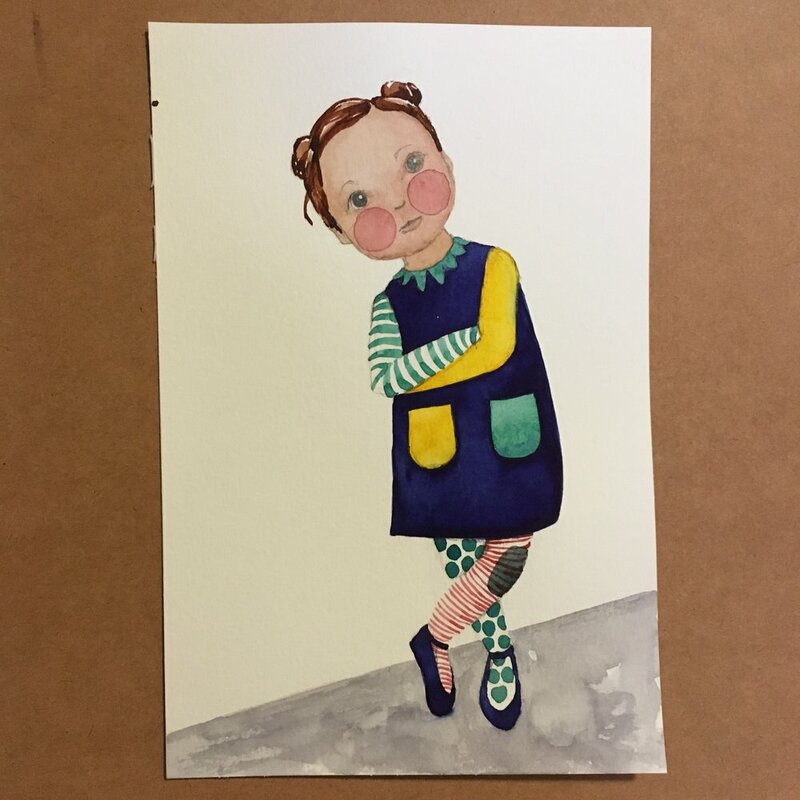 In any case, I had fun painting her tights, and wishing I had some just like that when I was little. But then, would I have been brave enough to wear them and be different? 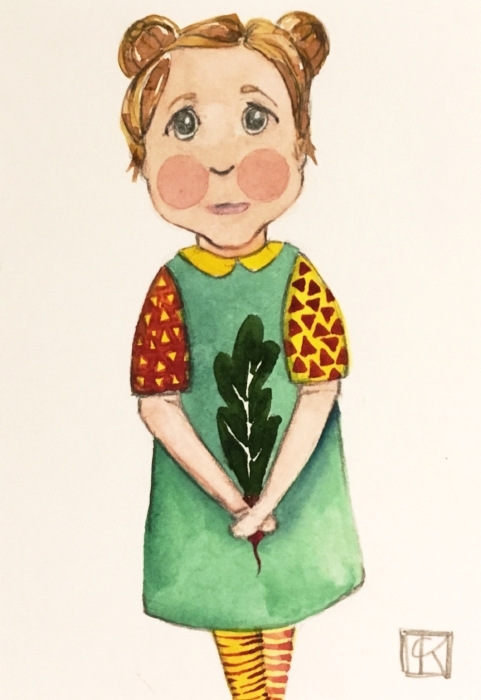 This girl is timid or maybe she knows she is in trouble for picking that turnip a bit early. But her puppy eyes make me think she is facing and owning her actions. That is my girl! This girl was the combination of all things experimental. I had a hard time with the sketch to begin with. Then I noticed I was painting in the wrong side of the paper after the fact, so my colors were quickly absorbed and turned muddy. Her posture is very stiff, and her pink leg got attacked by a extra loaded brush. 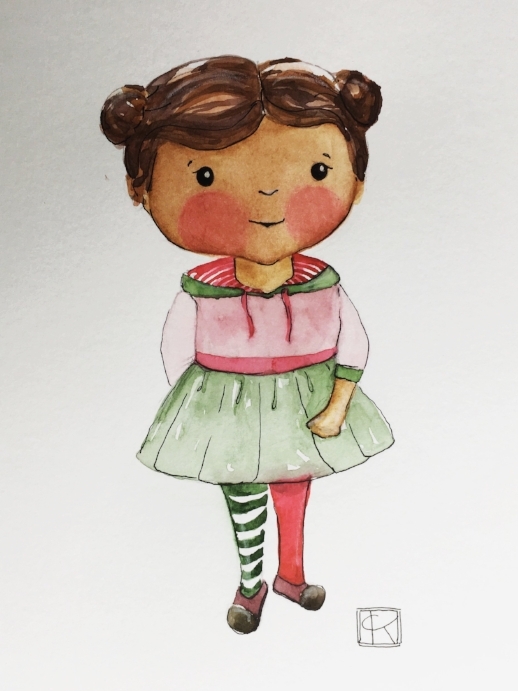 I was going for a complementary color palette and she looks like a mixture of Strawberry Shortcake and an elf. Cold pressed watercolor paper’s sizing/finish is different in each side of the paper and one is more absorbent than the other. Hot pressed watercolor, which is a smoother paper, absorbs water-media differently. It is not very forgiving, so you either paint fast, divide it in sections or use gouache. Going back to being brave. I may not wear the tights, but I am painting them and letting you see the learning in between. Not perfection, but progress. I hope you find your way of being brave this week.